The Hershey Bears seven-game road trip continues this week as the club will visit Wilkes-Barre/Scranton on Wednesday, and travels to Charlotte for games versus the Checkers on Friday and Saturday. 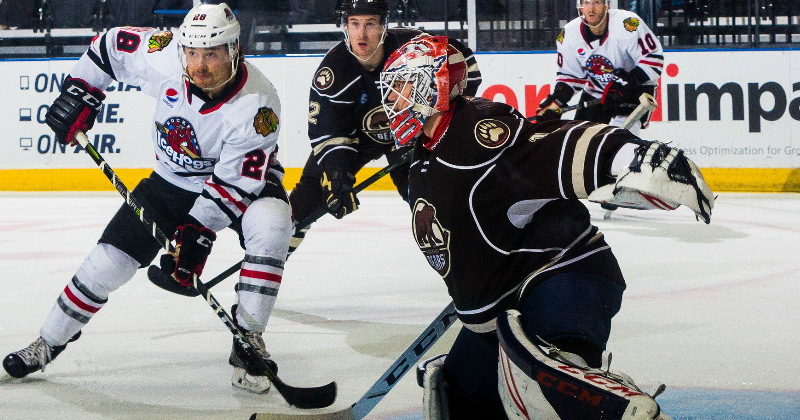 The start to the road trip in the Midwest was not favorable to Hershey, as the injury-riddled Bears dropped all three games last week to Western Conference opponents, falling to 0-5-0-0 on the season. Last Friday, Hershey opened up the road trip in Grand Rapids, suffering a 6-3 loss to the Griffins. Forward Sergei Shumakov scored a pair of goals for the Bears, and Connor Hobbs added Hershey’s first power play tally of the year, but a three-point night for former Bear Carter Camper propelled the Griffins to the win. Hershey was out shot 27-22 in the loss. In Milwaukee last Saturday, Hershey dropped a 5-1 decision to the Admirals. Derek Hulak had the lone goal in the third period for the Bears. Yakov Trenin had a goal and an assist for Milwaukee, earning the game’s first star. The trip to the Midwest concluded last Sunday in Rockford, with the Bears suffering a 5-2 setback to the IceHogs. Tyler Lewington and Liam O’Brien scored for the Bears, but Hershey hit three goal posts and were never able to take the lead before Rockford pulled away. Wednesday, Oct. 17 at Wilkes-Barre/Scranton, 7:05 p.m.
Friday, Oct. 19 at Charlotte, 7 p.m.
Saturday, Oct. 20 at Charlotte, 6 p.m. FEELS LIKE THE FIRST TIME: This past weekend marked firsts for many of Hershey’s young lineup. On Friday, forward Sergei Shumakov scored his first AHL goal, and Garrett Pilon added his first professional assist. Additionally, on Saturday, Maximilian Kammerer tallied an assist for his first AHL point. On Sunday, Beck Malenstyn assisted on Tyler Lewington’s first period goal, giving him his first professional point. MEGNA JOINS BEARS: Last Sunday, the Washington Capitals re-assigned forward Jayson Megna to Hershey. The veteran center made his debut with the Bears that day in Rockford. Megna has vast AHL experience. He played three years with Wilkes-Barre/Scranton from 2012-2015, collecting a team-best 26 goals during the 2014-15 season. He followed that season up with a career-high 44 points (15 goals, 29 assists) as an alternate captain with the Hartford Wolf Pack in 68 games in 2015-16. He has posted 126 points (60 goals, 66 assists) in 242 career AHL games. INJURY BUG: Entering the week, Bears forwards Riley Barber, Juuso Ikonen and Sergei Shumakov were battling upper body injuries, while Mason Mitchell is recovering from a lower body injury. Forward Mathias Bau remains on the Capitals injured non-roster list with an upper body injury. On the backend, both blue liners Kris Bindulis and Colby Williams have been sidelined with upper body injuries. WELCOME BACK MY FRIENDS: On Saturday, forward Derek Hulak made his Hershey debut after being added to the club’s roster earlier this month on a professional tryout agreement. After missing all last season due to injury, Hulak scored for Hershey in the 5-1 loss at Milwaukee, tallying in his first AHL game since Dec. 3, 2016. On Sunday, defender Logan Pyett made his Hershey debut. Pyett missed all of the 2015-16 and 2016-17 seasons battling sarcoma, a form of cancer. After recovering, he played in the Asia League last season before signing an AHL contract with the Bears. Sunday marked Pyett’s first AHL game in 2,003 days. BEARS BITES: On Sunday, defender Aaron Ness skated in his 500th professional game…Tyler Lewington’s goal versus Rockford on Sunday was his first since Nov. 11, 2017…Hershey’s 0-5-0-0 start marks the first time in franchise history the club has failed to record a standings point through the opening five games of the season.